Halwa as a technique is under appreciated by western cooks. The term halwa or halvah appears in a lot of middle eastern to south Asian cuisines, referring to a sweetened paste or cake or some sort, often additionally spiced with other flavors. Halwa is a common accompaniment to tea and other hot drinks. Multiple ingredients can be used as the basis of halwa, from vegetables, to grain, and nuts and seeds. In Israel, sesame seeds form the basis of halwa, optionally found chocolate covered for more decadence. In India, the true carrot cake, a carrot halwa, can be prepared by cooking down carrots with ghee and sugar. Or, as pictured above, doodhi - the bottle gourd. Also known as upo, the bottle gourd is eaten as a vegetable in many other cultures, in China, the Philippines, and Korea. Additionally, the dried gourd can be hollowed out and used as a bottle, hence the name. 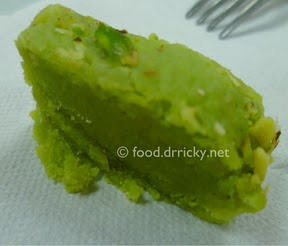 Making it into halwa, however, appears to be the purview of the Indian/Pakistani traditions. The vegetal notes and textures make for a delicious and interesting dessert. This one was purchased from Bombay Sweets.